"We take what we want by strength of honor, or not at all." 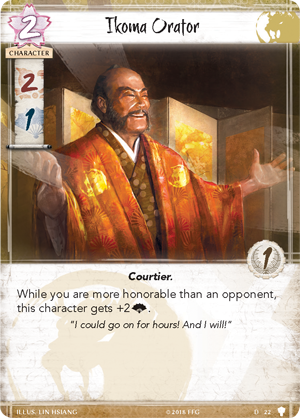 Honor defines the life of a samurai in Rokugan. It upholds society, determines your status, and is a core tenet of Bushidō. 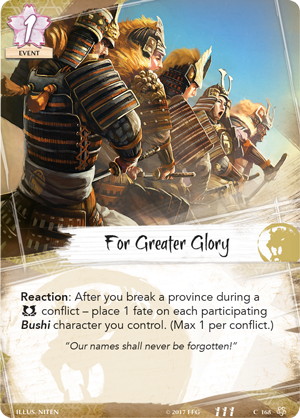 As Children of the Empire is a celebration of all things Rokugan, honor is a central focus of this Premium Expansion. 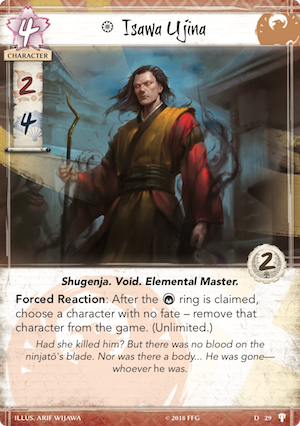 From the new composure mechanic, to rewards for remaining more honorable than your opponent, to new ways to honor your characters, Children of the Empire invites you to view Legend of the Five Rings: The Card Game in a whole new way! Join us today as we preview honor in Children of the Emperor through the lens of the Lion, Phoenix, and Unicorn Clans! 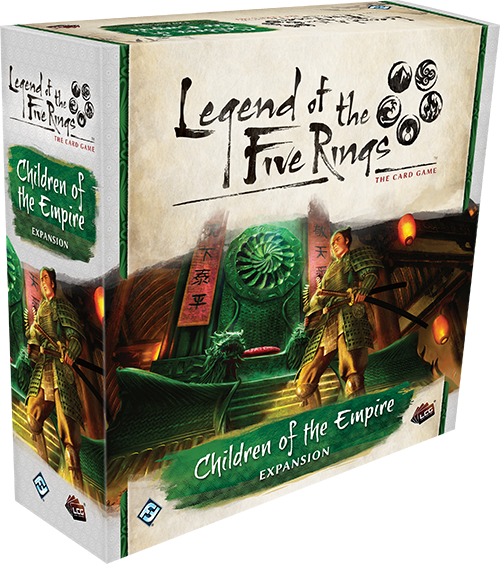 Children of the Empire is Legend of the Five Rings: The Card Game’s first Premium Expansion, featuring 234 cards (three copies each of 76 cards and one copy each of six cards) for all seven Great Clans. 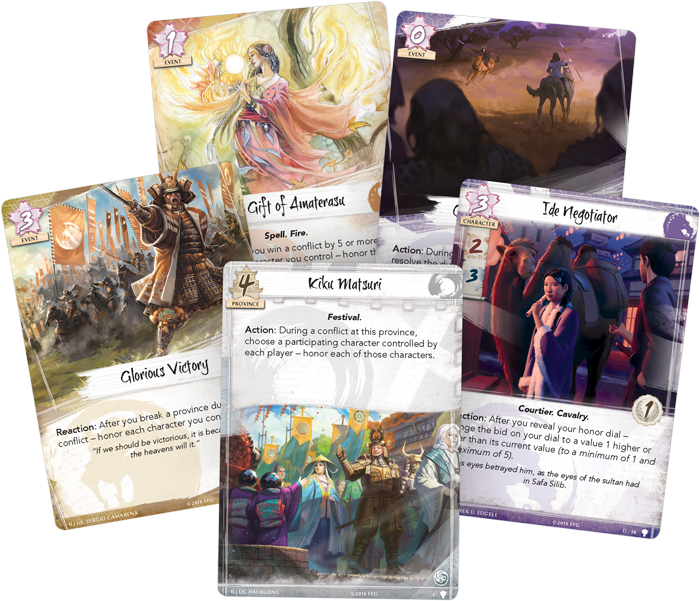 This massive influx of cards makes Children of the Empire the perfect next-step for new players and veterans alike. Few exemplify honor in the Emerald Empire like the Lion Clan. As the Emperor’s Right Hand, the Lion’s legion of soldiers are no strangers to the relationship between honor and victory. For example, the Ikoma Orator (Children of the Empire, 22) is a two-cost Courtier with two military and one political skill. Like the Lion’s Pride Brawler (Core Set, 75) before him, it may seem as though this Courtier is more attuned to the military side of the Lion. However, when you are more honorable than your opponent, he gains two political skill, making the Ikoma Orator a potent, cheap character who is sure to assist you in any situation. With Akodo Toturi acting as Emerald Champion, many Lion look to Matsu family Daimyō Matsu Tsuko (Children of the Empire, 24) for inspiration on the field of battle and beyond. Though she seeks vengeance on the Crane for the death of her betrothed, Akodo Arasou, she had the wisdom to release Doji Kuwanan to discover the mastermind manipulating their respective clans. Though the consequences of these actions are still unforeseen, few can question Tsuko's dedication to the Lion Clan and the Emerald Empire. 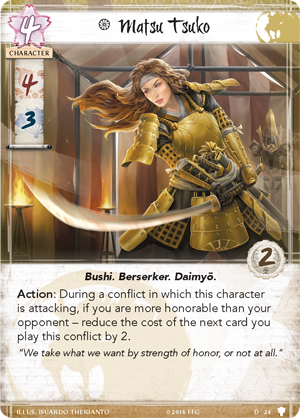 Matsu Tsuko always acts with honor, using her Action while you are more honorable than your opponent to reduce the cost of the next card you play in the conflict. Since fate can carry over from turn to turn, any fate saved can become a major boon in the future. 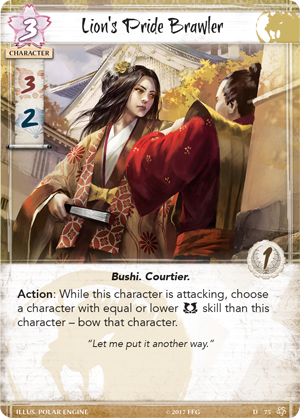 As a Bushi, Matsu Tsuko could allow you to attach a Sashimono (Core Set, 164) to her for free, negating any cost and allowing her to remain unbowed during the conflict resolution. And with four military and three political skill, Matsu Tsuko can be a difference-maker in multiple conflicts. 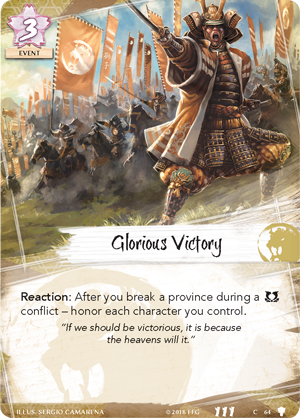 Should Matsu Tsuko trample your foes in a military conflict, you have the perfect opportunity to play Glorious Victory (Children of the Empire, 64), a new event that lets you honor every character you control after you break a province during military conflict. It’s important to note that this is not restricted to characters that participated in the conflict, like For Greater Glory (Core Set, 168). Your entire field will receive the boost, meaning the more characters you control, the more value Glorious Victory has. Not only will this give your characters additional skill, it can also greatly increase your honor when those characters leave the field. The Phoenix have always benefited from their high glory, but they have often struggled to take advantage of it by honoring their characters. Luckily, Children of the Empire both gives the Phoenix ways to honor their characters and ways to protect themselves from dishonor. 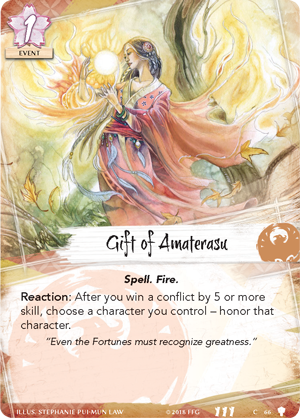 The Gift of Amaterasu (Children of the Empire, 66) presents a challenge to a Phoenix player, tasking them to win a conflict by five or more. In return for this feat, Amaterasu will honor one of your characters! The Phoenix are no strangers to dominating conflicts with powerful spells like Supernatural Storm (Core Set, 175), and now they receive a greater reward for crushing their opponent’s province. The Phoenix have also struggled with clans like the Scorpion, who can dishonor the Phoenix's characters with ease. 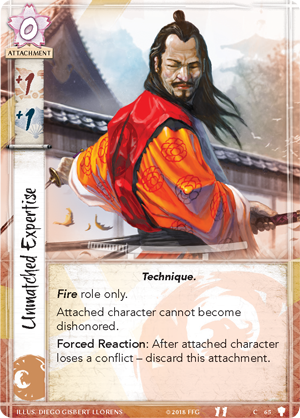 Now, the Phoenix can potentially protect themselves with cards like Unmatched Expertise (Children of the Empire, 65) that not only provide a skill boost, but protect the attached character from dishonor until they lose a conflict. This can protect characters like Isawa Kaede from losing value due to dishonor while also increasing their skills and making them a linchpin of your success. Isawa Ujina is depicted in Children of the Empire, and he is a powerful ally indeed, so long as his power remains under control. After the void ring is claimed, you choose a character with no fate and remove them from the game. While this ability can devastate your opponent, if you’re not careful, it may have unintended consequences. As a Forced Reaction, the ability will always trigger, and if your opponent has no fateless characters, the void will swallow your own characters whole, much like Isawa Ujina himself. The explosive power of the elements must always be contained, lest they turn on the Shugenja who utilize them. No one defines honor in the Unicorn Clan like the Utaku family. Though considered outsiders in the world of Rokugan, the Battle Maidens of the Utaku have taken to the code of Bushidō in every aspect of their lives. Utaku Kamoko’s (Children of the Empire, 40) honor is unshakable. Even when dishonored, Kamoko’s glory is not subtracted from her skills. Furthermore, after an opponent breaks one of your provinces, you can discard a card from your hand to ready and honor Utaku Kamoko. Though a province was lost, this puts Kamoko in the perfect position to have her revenge, as a six military, six political skill Battle Maiden is sure to terrify any foe. 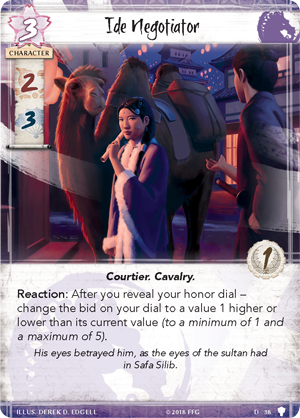 As the Utaku are skilled in combat and honor, the Ide are experts at making sure the Unicorn have the tools and resources they need to succeed, whether that is additional honor or conflict cards. The Ide Negotiator (Children of the Empire, 38) allows you to adjust your honor dial by one after bids are revealed. 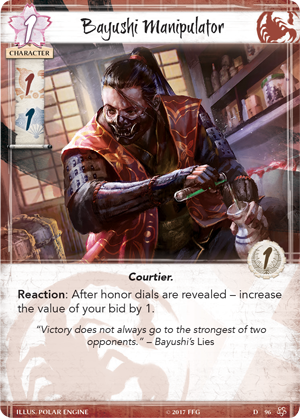 Cards like Bayushi Manipulator (Core Set, 96) have shown that manipulating your honor dial is a powerful mechanic, and with the introduction of composure it will only become better. Now, the Unicorn also have access to this powerful mechanic. Hisu Mori Mura was never a prominent village, but after Shinjo Altansarnai broke off her engagement with daimyō Ikoma Anakazu, the Lion Clan seized the town from the Unicorn. Matsu Mitsuko was placed in charge of the town and its castle, Hisu Mori Toride. 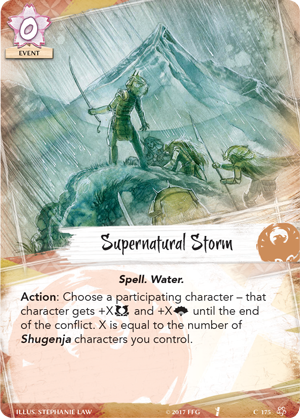 Despite being engaged—and close friends—Shinjo Shono brought his forces to the town in “A Swift End” by Lisa Farrell, from the Elements Unbound Dynasty Pack in the Elemental Cycle, to oppose Matsu Mitsuko and reclaim the village for the Unicorn Clan. 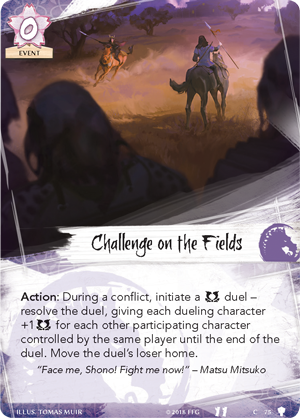 Challenge on the Fields (Children of the Empire, 75) brings this exact moment to Legend of the Five Rings: The Card Game, inviting you to initiate a military duel, supplemented by each other participating character, with the loser banished from the conflict. If you’re overwhelming your opponent with numbers, Challenge on the Fields is a great way to remove a threat from a conflict without sacrificing fate or characters. The code of Bushidō demands honor, and the Lion, Phoenix, and Unicorn are ready to answer the call in Children of the Empire! Join us next week to examine clans who perform their duty in a different way, interpreting honor in their own way or disregarding the need for glory. 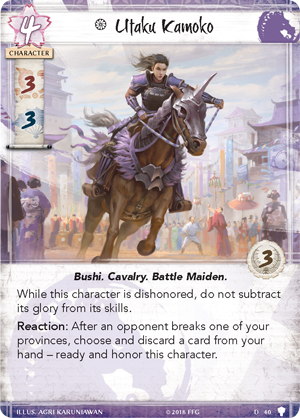 Embrace and celebrate honor with Children of the Empire (L5C16), available now for pre-order from your local retailer or our website!